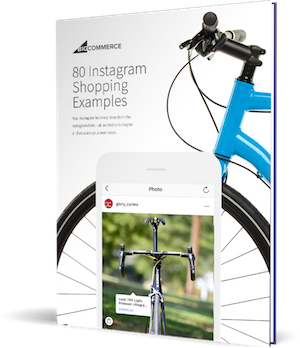 In March, BigCommerce merchants were among the first to gain access to Instagram’s new product tagging capabilities — built specifically for ecommerce brands — which significantly enhance product discovery on the platform. To use the feature, brands need only to push their inventory to Facebook (you can make this visible or not to your Facebook audience). See Native Union’s Facebook shop. After doing so, the Shopping on Instagram toggle should appear in less than 2 weeks. The fastest way to get ready to sell on Instagram is to get your store approved by Facebook Shop. Once approved, you will see a message within your Instagram app guiding you to connect your Facebook Product Catalog to tag products on your Instagram posts. Early adopters of the technology are reporting increased traffic and sales from Instagram as a result of the tagging capability. But what about Instagram is so unique – and how should you adopt this channel as part of a larger strategy? Instagram has been the de-facto platform for visual storytelling for years. It is lauded by consumers and brands alike for its unique focus on beautiful photography and videography, which collectively serve as vignettes into the lives, and lifestyles, of their creators. With shoppable posts, customers have even greater opportunity to connect with the brands they love through the ability to quickly see relevant information — like product descriptions and pricing — with a single click without ever having to leave the Instagram app. Additionally, once they’ve found an item to purchase, shoppable posts automatically provide links to corresponding product pages on your website so that customers can quickly add to cart and check out, or browse the remainder of your catalog. If you want to increase ROI on Instagram – or any channel for that matter – figure out how to use the platform the way consumers use it. If you’re salesy, people are going hate you. But, if you’re engaging, it will go a long way in terms of bringing you real, lasting customers. More than 800,000 shoppers use Instagram every month, and brands around the world are using the platform to share their stories and products with consumers in a visually engaging way. Excited to announce 800M users, 500M daily users, and 2M advertisers on Instagram. Honored to be a small part of this team. When it comes to Instagram, ecommerce businesses by and large recommend the platform. Whether you are advertising, building an audience or both – Instagram has fueled hundreds of thousands in sales. If you think about it, there is an obvious risk if you don’t have a shoppable Instagram. For example, if a customer sees an item they like on the platform, but there’s no way for them to buy the item or link to your site, you risk losing that sale. The rest of this article will walk you through the best-practice advice and revenue stats seen by brands using Shopping on Instagram. But, this is an Instagram feature — which likely means you don’t need stats or stories to convince you to to start using it. So, here’s how to get it for your brand right now. 1. Make sure your Instagram app on your phone is updated. Go to your phone settings and update the app if it is not. If you do not see any Instagram Shopping tags, this is because your app on your phone is not updated. 2. Make sure your product catalog is synced with Facebook Shop. Instagram pulls your Facebook product feed through – and you can connect your store with Facebook using BigCommerce’s Channel Manager. 3. Click the options tab on your Instagram business profile, scroll down to products and click. You’ll then be taken through a series of screens introducing you to the product. 4. Authenticate your Instagram business account via your Facebook account. The product will take you to this next step immediately. This is how Instagram knows what products you have. If you have not connected your store to Facebook Shop, do that now (step #2). Choose the product catalog you want to sync with Instagram for Instagram Shopping. 5. Upload your product photo. Now that you’re set up, go to upload a photo as you normally would. Then, on the caption page, you now have the options to tag people *and* products. Select “tag products” and tap on the photo to tag products, the way you would if you were tagging a person. In the search bar, type the name of the product in the photo. Select the product you are tagging and then move the tag on the photo to the correct spot. Instagram will pull in all product catalog information from Facebook, including a link back to your site from the photo. Again, go back to step #2 if this isn’t working for you. You can add up to 5 product tags per photo. 7. Hit share and your post with your shoppable tagged products is live! It is now time to reap the benefits of shoppable Instagram posts! More than 50 brands have been using Shopping on Instagram since before it’s Fall 2017 release. We’ve followed up with these beta brands to understand how the solution continues to work for them. Below, you’ll find the successes of 6 brands using the feature prior to public availability. Watches.com: Announcing feature via email. 1. Natori: 1,416% increase in Instagram traffic. “Instagram has played a major role in helping us build a brand, and we love how the new shopping features allow us to easily showcase our products in a way that feels authentic to the community we’ve built,” said Ken Natori, President for The Natori Company. “We announced the availability of Instagram Shopping on Twitter and Facebook. Overall, it has increased our traffic, the integration was quick and tagging is easy,” says Colin Talbot, Digital Marketing Manager, Natori. 2. Magnolia Boutique: 20% increase in Instagram revenue. “We’ve seen a traffic increase of 4% increase WoW since starting the shopping campaign and a 20% increase in revenue WoW,” says Susan DelPriore, Magnolia Boutique. “My best piece of advice is that, since this is very new, it is important to provide instructions and to cross-promote. Making sure your product feed is updated is very important,” says Susan DelPriore, Magnolia Boutique. 3. SpearmintLOVE: 13% increase in Instagram traffic. “We’ve seen a 12.61% increase in Instagram traffic (month over month) and an 8% lift in purchases attributable to Instagram Shopping (month over month),” says John Lott, CFO at SpearmintLOVE. 4. Native Union: 2,662% increase in Instagram traffic. “We are seeing the analytics in BigCommerce and it’s great to finally see Instagram traffic to the site,” says Tanya Keller, Community Manager, Native Union. 5. Watches.com: Still fine-tuning their approach. “We will be announcing it in an email blast and ICYMI sections of future email blasts,” Danny Hunsaker, Watches.com. 6. Marucci: Easy to implement. “We love the ability to use Instagram, our most engaging social platform, to direct customers to our products,” says Chad Vinges, Marketing, Marucci. “While we’ve been able to implement the product-tagging feature, we’re in the middle of a low-selling, low-engagement season, so we’re not able to see any real change thus far (only one week of use). Alert your customers to the new feature via email or Instagram stories. Start tagging all of your products to build an expected behavior. Track results in your analytics via the l.instagram option. Do you want to see similar results to the stats and stories above? Great – then you need to know how to find how your Instagram Shopping tags are performing. On Instagram: Under your post analytics, there are Instagram Analytics on your click-thru on Instagram Shopping as well as to your site. Your BigCommerce Analytics: If you are using the new analytics, then under Marketing >> click on Social >> click on Instagram >> measure l.instagram revenue and traffic week over week (or month over month) to see how much Shopping has worked. You can even make sure BC and Instagram Analytics are showing similar #s based on visits. I’m actually quite excited to try Shopping on Instagram out for myself. I love how seamlessly integrated it is and how you can showcase the product and price upfront. Many consumers want to know as much about the product before they head to buy. In a world where many people have a short attention span, this HELPS! – Nancy Badillo, Digital Marketing Specialist, NancyBadillo.com. According to Instagram, consumers are rapidly adopting Instagram Stories as a new way to visually communicate and connect, with more than 300M accounts now using stories on a daily basis. In a recent survey, people said they often watch stories to stay in the know with brands they’re interested in, get an insider view of products they like, and find out about new products that are relevant to them. People are highly engaged with stories produced by businesses, and product stickers makes shopping easier by providing quick access to information on multiple products without going off-site. To account for this uptick in Story activity and make it easier for brands and consumers to build long-term relationships, Instagram is launching Shopping in Stories. What is Instagram Shopping in Stories? Starting June 12, 2018, Instagram will be bringing shopping on Instagram into stories, and will start by testing product stickers with a shopping icon. Select businesses participating in the test will be able to create up to 3 product stickers per Instagram story, and can use stickers with swipe-up, highlights, and videos. When people see stickers with a shopping icon, they can tap to see more information in the product details page, and go to the businesses’ website. This feature is currently in testing, and will become broadly available to shopping businesses in the coming months. We will keep you updated here for more information. In the meantime, here are a few Instagram Shopping in Stories FAQs. How should businesses think about shopping in stories vs feed? Both feed and stories are great places for businesses to reach customers, and Instagram knows that people often become more interested in a brand or product after seeing it on Instagram. In general, you should use both features and functionalities. People turn to Instagram Stories when they want to see behind the scenes content or get an insiders view of products they might like. Will Instagram bring shopping to feed videos? There are no plans for this feature from Instagram at this time. Is this available to all businesses? At this time, it’s available to a limited set of businesses that use shopping on Instagram. Who can see the shopping stickers in stories? All consumers globally can view and interact with the shopping stickers. How did Instagram select the test participants? Instagram selected a range of brands from around the world that have been using Instagram in creative ways to reach their community. What does Instagram hope to learn from the test? This is the first iteration of shopping in stories, and both Instagram and BigCommerce are really excited to see how people engage. Instagram will be monitoring to ensure that the sticker is easy to engage with and easy for businesses to use. Will shopping come to other parts of Instagram (Direct, Explore)? Instagram is always thinking about how they can evolve shopping on Instagram but have nothing to share at this time. There is no timeline to share at this time. Check back frequently for additional updates. Shopping on Instagram is not an advertising opportunity. As a result, you will see better engagement if your customers are already engaged with you on Instagram. Here’s how to build an engaged Instagram audience to increase the effectiveness of the Shopping on Instagram feature. Post genuine pictures: Anything that looks too photoshopped or too perfect won’t fly. Showcase your customers: Encourage user generated content via packaging and then use those images on your feed. Take photos everywhere: Don’t get distracted by the need for camera “gear.” Your phone is your gear. Get to snapping! Partner with others: You don’t have to do Instagram alone, and you shouldn’t. Partner with complementary brands to build your audience and share the love. Don’t make it all about selling: Instagram users need a personal reason to follow a business. Use hashtags to grow your followers. How? Check out this guide. 1. Wooing 164,000 instagram followers. With more than 164,000 Instagram followers and $0.11 average cost per conversion across Instagram and Facebook audiences, Spearmint LOVE is one of the most successful Instagram advertisers on the platform. Shari and John Lott credit the success to Shari’s expert eye for merchandising and design. Here’s their advice on how to grow an audience and advertise to them effectively. Get the details on how this brand broke the SMB glass ceiling. What is your #1 priority in creating an engaging Instagram business profile? If I had to pick the most important thing, I would say the pictures need to feel genuine. Posts that feel over “photo-shopped” often lack an authenticity that is really critical to connecting with your audience. Find a style that works for you and post often, i.e. 3 to 5 times a day. What advice would you offer other online businesses looking to grow on Instagram? The most important advice is be very particular about what you post. If your feed lacks a cohesive feel, your audience will have a hard time relating to your content. Once you have a clear aesthetic that is resonating with your audience, network with other Instagrammers with a similar size audience. In our early days on Instagram, we did a lot of “friendly follows” with other Instagram accounts that we respected and that were a good fit for our audience. Shopping on Instagram is going to be huge for ecommerce businesses. Pinterest has already proven this to be a successful model. The average order value of sales coming from Pinterest is $50. Thinking about that in terms of Instagram, Yotpo found Instagram engagement rates were 45% longer than visitors from Facebook, 62% longer than visitors from Pinterest, and 40% longer than visitors from Twitter. 2. Using Instagram to drive 25,000 visitors per day. With more than 261,000 Instagram followers, The Pink Lily Boutique has successfully turned their Instagram feed into a highly profitable channel, helping to turn $1M in monthly revenue for the brand. Here is how the Pink Lily team engages with their audience to grow a massive fan base and tons of sales. With 600+ orders and 25,000 site visitors per day and $1M in monthly revenue, see exactly how Pink Lily Boutique scaled operations to meet their massive demand. What are the top priorities in creating an engaging Instagram business profile? 1) We post 8-10 times per day, 7 days a week, so there is always fresh content to be seen by our fans. Some are product images, some are lifestyle shots, some are funny videos. We like to mix it up! 2) We offer Instagram photo contests and giveaways for customers to win free merchandise or a gift card! A customer has to tag their friends and share one of our contest posts and we will pick a random winner every week! Everybody loves free stuff, so this is always a popular promotion for us. 3) We ship all items to our customers in a custom poly mailer bag to drive user-generated content. The bag has our logo and our own exclusive hashtag for customers to tag us on Instagram when they take a selfie in their new outfit. If customers post a selfie on Instagram wearing our clothes and tag #pinklilystyle, they will be featured on the front page of our website. This has been a great promotion. Customers love the idea of being featured on a website that has 25,000 visitors per day. 4) We let our customers choose which items we buy. When shopping for new items or attending a market, we let the customers ‘Be the buyer.’ We take pictures of the items we are considering and then we post them to our social media pages, asking our fans to ‘be the buyer’ and let us know what they think about particular items. This not only gives us a look at the specific buying habits of our customer, but our fans feel great knowing that we value their input and we try and stock our website based on the items that they truly want. Keep your customers engaged! Ask their opinions, give away items, make them laugh, etc. An engaged fan is more likely to turn into a customer. Make sure they know that you value their input and want them to be extremely satisfied with their purchase. 3. Using stories to sell 48,200 fans. With more than 48,200 Instagram followers, Grace & Lace skyrocketed to a household name when they appeared on Shark Tank. Today, the team uses Instagram to connect with their audience and fans across the country. Here is their best advice on how to grow a loyal base. Selling so much through Instagram and other channels including Facebook and Pinterest can be challenging. Here’s how the Grace & Lace team figured it all out. For us, we work to strike a balance between promoting our products, giving our fans a behind the scenes look at Grace & Lace, sharing my life as a mom, wife, and entrepreneur, and adding a little levity or inspiration to their week. We try to build a valuable relationship with our fans so that when they’re ready to buy something they can’t try on first or see in person, they have had positive interactions with our brand online and they trust me and Grace & Lace enough to take that leap of faith. Tell your story. Facts tell, stories sell. Most products we sell are shot on a mannequin first. We’ve tested and 100% of the time, a model photo, flat lay, or even a selfie photo gets more engagement than a mannequin photo. It’s the same product, but a shot of the model walking down the street on a pretty day shows an experience. The flat lay complete with accessories shows an experience. The selfie shows an experience. And don’t get sidelined by ‘the gear’ involved in taking great photos. It’s not about the gear. It’s about connecting people to your story, to the experience, of your company. 4. How to find a balance with 45,200 followers. With more than 45,200 Instagram followers, Nickel & Suede admits they began on Instagram early –– and have long been awaiting shoppable posts to make Instagram advertising as successful as Facebook’s. Here is their best advice on how to grow a large following and advertise effectively. What are some tactics you’ve used to create an engaging Instagram business profile? When we started Nickel & Suede, Instagram was still growing in popularity and we knew that it was somewhere we needed to have a strong presence. We started off by networking and collaborating with other brands that we related to and that was a big initial boost at a time when users were first creating IG accounts and choosing who to follow. We quickly found that the biggest struggle was having enough continually engaging, high-quality content. We’ve worked hard to create great imagery to share with our followers that is informative and personal. We try to keep our followers updated in real-time with information about new releases, behind the scenes and sneak peeks. We also try to think of our audience as “new” every couple of months so we shift to introducing ourselves every so often or sharing little “did you know” bits about us. We think our followers appreciate using IG as a platform where they can get to know us without scouring our website. It’s been interesting to find a balance for our business on a platform like Instagram because most of its users are there and have been there for personal reasons. They want to connect with friends and family there and so finding a way to fit your business into someone’s personal feed is a hard thing to do. So, my advice is first, you have to have great images. Whether you take them with your phone or your camera, make sure they are interesting and high quality. What you say in your caption also matters, but the picture is what sells you. Second, I would suggest finding ways to keep the platform personal to your customer. Find ways to make them feel like an insider. Offer behind-the-scenes shots or share something personal about employees. Don’t make it all about selling. Instagram users need a personal reason to follow a business. That being said, Instagram has been shifting and changing over the last year. It is becoming more like Facebook in that it is slightly less personal and will soon have more ways to boost for businesses. Follower growth is slower than ever right now, but we don’t think it will stay that way. We are sure Instagram will slowly become an even better and better place for businecrsses to be. And when they start offering more ways to advertise and easier ways to sell through the platform, it will be pay to play. It will be worth it just like it’s worth it to pay to play on Facebook. No longer do you have to point people back to the link in your bio. Shopping on Instagram is here. It is working. Brands like Natori, Native Union and Olive Clothing are seeing increased Instagram traffic and sales. This channel works best if you already have an engaged Instagram audience. The more engaged, the more sales you will get. I really love Shopping on Instagram. You now have the possibility to show images of your products without having to link to them in your bio. This is a feature I’ve really been looking forward to. The problem was that people couldn’t just click the image and buy the product. We had to list every single item on the image correctly according to the product name on the website. This quickly becomes a problem if you have many products in one image. Moreover, users had to click the link in our bio, and search for the product on the website and then buy it. That process is way too complicated, and most users will drop off before completing the purchase. The new feature allows you to tag your products in the images and then users can click on the product on the image and be sent directly to the product page where they can buy it. – Emil Kristensen, CMO & Co-Founder, Sleeknote. For more on how to take your Instagram marketing to the next level, check out this guide from JumperMedia.